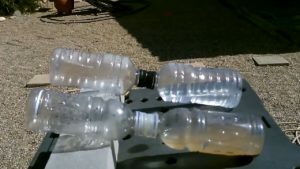 This video shows the build of a Simple Solar Water Distillation System for survival/SHTF situations.This is made using 2 clear (plastic or glass) bottles and glue (or tape).Fill one bottle with dirty/or saltwater,then connect the second bottle and set in the sun.Within a few minutes the water begins to evaporate and the other bottle collects the clean distilled water vapor.make sure the bottles have an airtight connection. prop up bottles at a slight angle so as the dirty/or saltwater starts to evaporate – the max. amount of water vapor will travel up to the higher collection container. works best in bright sun.